"CC (New York City Subway service)" redirects here. For the shuttle service that also carried the CC designation, see Rockaway Park Shuttle. The C Eighth Avenue Local is a 19-mile-long (31 km):1 rapid transit service in the B Division of the New York City Subway. Its route emblem, or "bullet", is blue since it uses the IND Eighth Avenue Line in Manhattan. The AA and CC services were the predecessors to the current C service. A and AA service began on September 10, 1932 with the opening of the first line of the Independent Subway System (IND), the Eighth Avenue Line. The IND used single letters to refer to express services and double letters for local services. The A ran express and the AA ran local from 168th Street to Chambers Street/World Trade Center, known at the time as Hudson Terminal. The AA ran at all times, and it was extended to 207th Street during nights and on Sundays when the A did not run. On February 1, 1933, the AA was extended to the newly-opened Jay Street–Borough Hall station when the A did not run, continuing to terminate at Chambers Street when the A did run. The C and CC services began operation on July 1, 1933 when the IND Concourse Line opened. The CC provided local service between Bedford Park Boulevard and Hudson Terminal during rush hours, and was extended to 205th Street during non-rush hours. It replaced the AA as Eighth Avenue Local. The C ran express, from 205th Street to Bergen Street in Brooklyn during rush hours. Beginning August 19, 1933, C service was cut back from Bergen Street, but started operating during non-rush hours. At the same time, CC service was cut back from 205th Street during non-rush hours. On January 1, 1936, C service was extended to Jay Street–Borough Hall. On April 9, 1936, C service was extended to Hoyt–Schermerhorn Streets. After July 1, 1937, a few C trains continued to run to Bergen Street southbound in the AM rush hour and northbound in the PM rush hour. Also on the same date, weekend C service was discontinued, and CC service was extended to 205th Street to compensate. 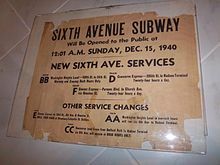 On December 15, 1940, the IND Sixth Avenue Line opened. Two new services, the BB (later B) and D, began running. These lines ran on the Eighth Avenue Line in upper Manhattan, switching to the Sixth Avenue Line in Midtown. The BB ran local to 168th Street during rush hours. The D joined the C as the peak direction Concourse Express. CC trains now ran between Hudson Terminal and Bedford Park during rush hours and on Saturdays and during other times, the D made local stops in the Bronx, replacing CC service. On the same date, limited morning rush hour service began between 205th Street, Bronx and Utica Avenue, Brooklyn, making local stops on the IND Fulton Street Line. AA service was reinstated during this time, but only during off-peak hours (non-rush hours, late Saturday afternoons and Sundays) when the BB and CC did not operate. The CC would provide Eighth Avenue Line local service during rush hours, with the AA replacing it during off-peak hours, mostly unchanged until 1988. Beginning October 10, 1944, C trains no longer ran on Saturdays. On October 24, 1949, C express service was discontinued. Additional D service was added to offset this loss. The CC, which only ran during rush hours, began terminating at Broadway–Lafayette Street Mondays to Fridays, and on Saturdays CC service continued to operate to Hudson Terminal. On December 29, 1951, Saturday CC service was discontinued. Weekday CC service returned to its previous terminal at Hudson Terminal on October 30, 1954. On August 30, 1976, the CC train replaced the E train as the rush-hour local along the IND Fulton Street Line and IND Rockaway Line, running from Rockaway Park–Beach 116th Street in Queens through Brooklyn and Manhattan to Bedford Park Boulevard in the Bronx, making it the only service to run through all four boroughs served by the subway. The Rockaway Park Shuttle HH was renamed CC. This shuttle ran between Broad Channel and Rockaway Park during off-peak hours, except late nights. With this, all daytime service to/from Rockaway Park was named CC. Late nights, the shuttle ran between Euclid Avenue, Rockaway Park and Far Rockaway-Mott Avenue via Hammels Wye, and was labeled A. On August 28, 1977, late night AA service was eliminated; the A now runs fully local at night. On May 6, 1985, the IND practice of using double letters to indicate local service was discontinued. The AA was renamed the K and rush hour CC service was renamed C. The off-peak Rockaway Park Shuttle is renamed H. This change was not officially reflected in schedules until May 24, 1987. On December 10, 1988, the K designation was discontinued and merged into the C, which now ran at all times except late nights. :17 The C ran from Bedford Park Boulevard to Rockaway Park during rush hours, 145th Street to Euclid Avenue during middays, and from 145th Street to World Trade Center during evenings and weekends. The A now ran express in Brooklyn during middays, and the B was extended to 168th Street during middays and early evenings. On October 23, 1992, rush hour C service was cut back from Rockaway Park–Beach 116th Street to Euclid Avenue. Now, five A trips in each direction run from 59th Street–Columbus Circle to Rockaway Park during rush hours, with the Rockaway Park Shuttle (renamed from H to S) operating between Broad Channel and Rockaway Park at all times. On May 29, 1994, weekend service between 7 a.m. and 11 p.m. was extended to 168th Street to allow A trains to run express. Beginning April 30, 1995, C service was extended to 168th Street during middays as construction on the Manhattan Bridge cut B service from Manhattan. On November 11, 1995, midday service was cut back to 145th Street after B service to 168th Street was restored. The B and the C, which both ran local along Central Park West, switched northern terminals on March 1, 1998, ending the connection between the C and the Bronx. Instead of alternating between three different terminals depending on the time of day, all C service now terminated at 168th Street. The change was made to reduce crowding on the C and to reduce passenger confusion about the C's route. Starting on May 2, 1999, C trains were extended to Euclid Avenue on evenings and weekends; the C now runs local in Brooklyn and Manhattan, and the A express, at all times except late nights. In the wake of the September 11, 2001 attacks, World Trade Center station was temporarily not usable as a terminal for the E. C service was suspended until September 24, 2001. Local service along Central Park West was replaced by the A and D, and the E was extended from Canal Street to Euclid Avenue replacing C service in Brooklyn. On January 23, 2005, a fire at the Chambers Street signal room crippled A and C service. C service was suspended until February 2 and was replaced by the A, B, D, E, and V along different parts of its route. Initial assessments suggested that it would take several years to restore normal service, but the damaged equipment was replaced with available spare parts, and normal service resumed on April 21. In August 2012, the Straphangers Campaign rated the C train the worst of the city's subway services for the fourth straight year. No other service has ranked worst for more than three years in a row. The group found that the C performed worst in three of the six categories in its annual State of the Subways Report Card: amount of scheduled service, interior cleanliness, and breakdown rate. It also ranked next-to-worst in car announcement quality, after the 7, but performed above average in regularity of service and crowding. The New York Times called the C the "least loved of New York City subway lines", citing its fleet of R32s, which are the oldest cars in the system at 54 years old. The New York Times has also stated that the C train "rattled and clanked along the deteriorating maze of tracks beneath the city, tin-clad markers of years of neglect." The R32s have been criticized for breaking down far more often than any fleet in the system, averaging just 33,527 miles between failures. The average subway car can travel 400,000 miles before breaking down. In 2011, problems with the R32s were at a peak as the fleet's failure rate was rising steadily. In 2012, money was directed to replace the R32 with a new contract called the R179. Bombardier Transportation won the $600 million contract to build 300 new cars. The R179s were expected to replace the R32s with some being allocated to the C. However, delivery of the R179s was delayed until 2017 and some R32s will remain in service after the order is completed, so stopgap measures had to be implemented. Most trains on the C are only 480 feet (146 m) long due to lower ridership levels on this service. For the summers of 2011 and 2012, R46 trains ran on the C while R32s were moved to the A to save their older air conditioning units from having to work underground at all times. This contrasted to those on the rest of the "B" Division (except for the Eastern Division and G train), which are 600 feet (183 m) long. Since 2013 due to passenger complaints, many R160A cars have operated on this service, first during the summer months, then permanently. Most of the R32s were transferred to the mostly outdoor J/Z for the same reason. By May 2015, more than half of the C train's fleet utilized R160As. After several failed proposals to permanently lengthen C trains as ridership increased, some R46 trains were again assigned to the C in December 2017, displacing some of the route's R32s to the A. The R46 trains running on the C were 600 feet long. In November 2018, several 480-foot-long R179 trains started running on the C, allowing for the R160A trains to gradually be transferred back to the J/Z. However, by the next month, almost all R179 trains on the C had to be briefly taken out of service due to manufacturing defects and HVAC software bugs; these have since been corrected and affected trains were placed back in service. ^ a b "C Subway Timetable, Effective June 24, 2018" (PDF). Metropolitan Transportation Authority. Retrieved June 24, 2018. ^ a b c d e f "Review of the A and C Lines" (PDF). mta.info. Metropolitan Transportation Authority. December 11, 2015. Retrieved January 19, 2016. ^ "Gay Midnight Crowd Rides First Trains in New Subway". The New York Times. September 10, 1932. p. 1. Retrieved June 29, 2018. ^ a b c d Chiasson, George (November 2011). "A History of the A Train". The Bulletin. Electric Railroaders' Association. 54 (11): 3 – via Issu. ^ "City Opens Subway to Brooklyn Today". The New York Times. February 1, 1933. p. 19. Retrieved June 29, 2018. ^ "New Subway Link Opens Wednesday: Independent Line Will Offer Express Service to Borough Hall in Brooklyn" (PDF). The New York Times. January 29, 1933. Retrieved November 4, 2015. ^ a b c d e f g h i j k l m Bolden, Eric. "NYCT Line by Line History". www.erictb.info. Retrieved June 9, 2016. ^ a b c d e f g h Korman, Joseph. "IND Subway Services". thejoekorner.com. Retrieved October 7, 2018. ^ "New Bronx Subway Starts Operation; $40,000,000 Branch of City System Opens at 1 A.M. With 80 on First Train. Link to Westchester Expresses to Bring 205th St. Within Half Hour of 42d -- 46 Minutes to Brooklyn". The New York Times. July 1, 1933. ISSN 0362-4331. Retrieved June 20, 2016. ^ "IND Faster Service Will Start Sunday" (PDF). New York Times. October 20, 1949. ISSN 0362-4331. Retrieved February 20, 2016. ^ "Bronx to Coney Ride In New Subway Link" (PDF). New York Times. October 18, 1954. ISSN 0362-4331. Retrieved February 20, 2016. ^ "Hey, What's a "K" train? 1985 Brochure". Flickr. New York City Transit Authority. 1985. Retrieved June 17, 2016. ^ Annual Report on ... Rapid Routes Schedules and Service Planning. New York City Transit Authority. 1989. Archived from the original on July 31, 2018. Retrieved March 25, 2018. ^ "Changes in B & C service". New York Daily News. February 24, 1998. Retrieved March 29, 2019. ^ Chan, Sewell (January 25, 2005). "2 Subway Lines Crippled by Fire; Long Repair Seen". The New York Times. ISSN 0362-4331. Retrieved October 7, 2018. ^ Kabak, Benjamin (August 24, 2010). "Remembering a fire at Chambers St". Second Ave. Sagas. Retrieved October 7, 2018. ^ a b Grynbaum, Michael M. (August 26, 2011). "For Often-Late Cars of Subway's C Train, Retirement Must Wait". The New York Times. ISSN 0362-4331. Retrieved August 26, 2011. ^ "State of the Subways 2012 table". straphangers.org. Straphangers Campaign. 2012. Retrieved August 1, 2012. ^ a b "How Did the Subway Get So Bad? Look to the C Train". The New York Times. ISSN 0362-4331. Retrieved July 12, 2018. ^ Santora, Marc (June 6, 2017). "How Did the Subway Get So Bad? Look to the C Train". The New York Times. Retrieved October 7, 2018. ^ Barone, Vincent (December 18, 2017). "MTA adds longer cars to C trains to alleviate rush-hour crush". AM New York. Retrieved December 19, 2017. Wikimedia Commons has media related to C (New York City Subway service). "C Subway Timetable, Effective June 24, 2018" (PDF). Metropolitan Transportation Authority. Retrieved June 24, 2018.